We have recently changed our Swatch Policies to serve our customers better so please read the following. We don't just want to give you good service, we want to give you MUCH BETTER SERVICE than any of our competitors. We also want you to ABSOLUTELY LOVE your new futon cover, so that you'll visit us again when you need another cover, or anything else futon related, and we'd like you to recommend us to your friends and family. 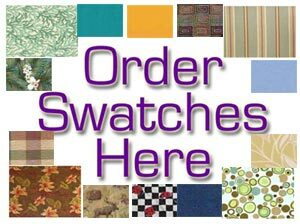 Fabric Samples are either $3.00 each. The sizes vary from 2" X 4", to 6" X 6" or larger. They come directly from the manufacturer to assure the most recent dye lots match. To order samples just add the exact names of the fabrics above, in the blank fields below, and add them to your cart. You can order more than 5 by adding another item to your cart. Then just press Checkout! When you place your order for samples, please use the EXACT NAME of the fabric, and when you checkout, give us as many details as you can in the Notes section of your order. Enter the size of futon cover you need, along with the colors, type of fabric, cleaning care, and other details. Our fabric experts might recommend some other fabrics, and they might realize that one that you've ordered doesn't match what you're looking for. As always, if you have any questions, contact Customer Service.